Summary: Alex was left alone for the weekend while his family goes to visit relatives. While home alone, the supervolcano in Yellowstone erupts unexpectedly and Alex is suddenly thrown into an apocalyptic disaster and all he wants to do is find his family who is over 100 miles away. What I Think: In my review for Susan Beth Pfeffer's apocalyptic novel, Life as we Knew it, I said, "This is the first book I've ever read that made me be scared for an apocalypse... this book terrified me; however, this made me not want to put the novel down." 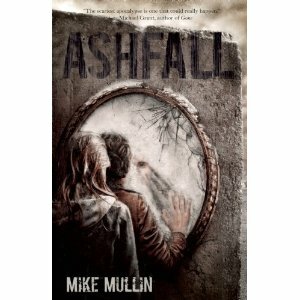 Ashfall does what Pfeffer's book did, but Ashfall also intrigued me in a different way because of my fascination with volcanoes- I was filled with a mix of terror and fascination all through the novel. Mike Mullin took a possible future disaster that in all speculations could happen and threw us as readers into the middle of it. When you start the book, you know that a horrible event is going to happen. Alex, our narrator, tells us how different everything is now, but this slight preface cannot prepare you for all of the destruction, criminal activity, devastation and loss that happens throughout this novel. *Loved that Alex described history books and si-fi books as past & future history. *The analogies throughout the novel to help readers understand what Alex is going through are superb. My favorite was describing explosions as Zeus machine-gunning thunder. *Liked that Mike never felt he needed to explain about the gay couple who lived across the street from Alex, it was just normal. There are more snatches of text that I marked later in the book, but I do not want to give away any of Alex's journey. Writing Prompts: Alex ends up home alone when the volcano erupts because he was fighting with is mother. What is a time that you fought with a family member that you later regretted doing so? ; Alex has to make many choices as he is struggling to find his family. What is a decision that Alex made that you disagree with? One that you agree with?